Listen to Alan Senauke on WBEZ’s Worldview! 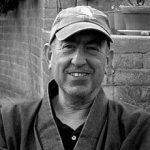 Hozan Alan Senauke, Vice Abbot of the Berkeley Zen Center and former Executive of the Buddhist Peace Fellowship, recently spoke at Ancient Dragon and DePaul University. He was interviewed by Jerome McDonnell of WBEZ about Protecting Rohingya and Building Community Through Buddhism. Click here to listen to the WBEZ interview.